Question mark? That's the very serious question debated in the latest EconTalk discussion between Russ Roberts and Arnold Kling. Along the way you'll learn more than you ever wanted to know about Credit Default Swaps (other than why anyone thought they were a good idea in the first place). Their discussion raises an important issue: what we are experiencing in the global economy right now is way outside the parameters of any economic textbook. As Russ puts it: nobody studying economics in third level today will learn that, when confronted with an implosion of the global financial system, then governments should a) buy banks and b) pump trillions of taxpayers dollars into keeping them afloat, no matter what. So have we thrown out the macroeconomics text book - or macroeconomics in its entirety? It is more than just an academic issue. As Arnold Kling explains: we now have huge disconnection in the form of a concentration of economic power (Fed/Treasury) and dispersal of economic knowledge (businesses/consumers). The same applied to the Bear Stearns and Lehman Brothers of this world, as Kling puts it: the nerds down below were the only ones who understood the real risks that were being taken, but the suits at the top neither understood nor wanted to know. Every time a U.S. treasury secretary, a Canadian finance minister, a British central banker and a Chinese Communist official announces some major new initiative, or changes previous plans, or declares that more action will be taken in future, the people who actually make economic decisions are left deeper in the dark. Consumers don’t know whether to buy a new car, lenders don’t know whether to lend to car buyers, car makers don’t know whether to make new cars, and investors avoid investing in car companies. The chain of confidence has been shattered. As he puts it: whenever you hear a politician use the word stability check your purse or wallet as you'll be paying for it. 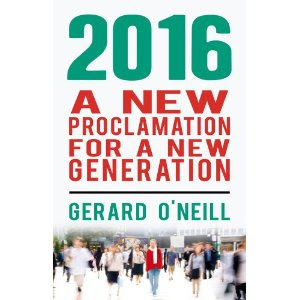 There are lessons here for Ireland of course. The Irish Times leads today with a story that Irish banks rescued by the Government's guarantee scheme will have to raise billions in funding in the coming weeks - a real test of whether the 'rescue' has worked or not. Yet, as I've pointed out before, the Financial Support Act 2008 governing the banks is extremely onerous. In a desire to secure stability, the Irish Government may well have guaranteed instability if potential investors and lenders decide to give Irish banks a wide berth. Restoring the chain of confidence after it has been shattered is a mighty difficult task. One key confidence builder is honesty. Telling it as it is: and how you think it will be. To their credit, the Bank of England are doing just that. 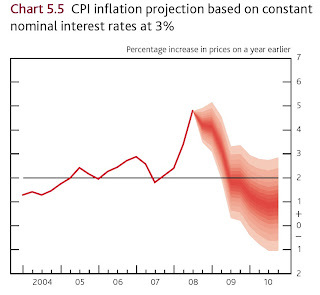 Their Inflation Report for November 2008 is a model of clarity - even when discussing uncertainty. The chart above is from the section on the inflation outlook. It shows a real risk of deflation for the UK economy for the first time. Hence the speculation yesterday that UK inflation rates could even go as low as zero. Try finding all that in a macroeconomics textbook. Still, there's always microeconomics.